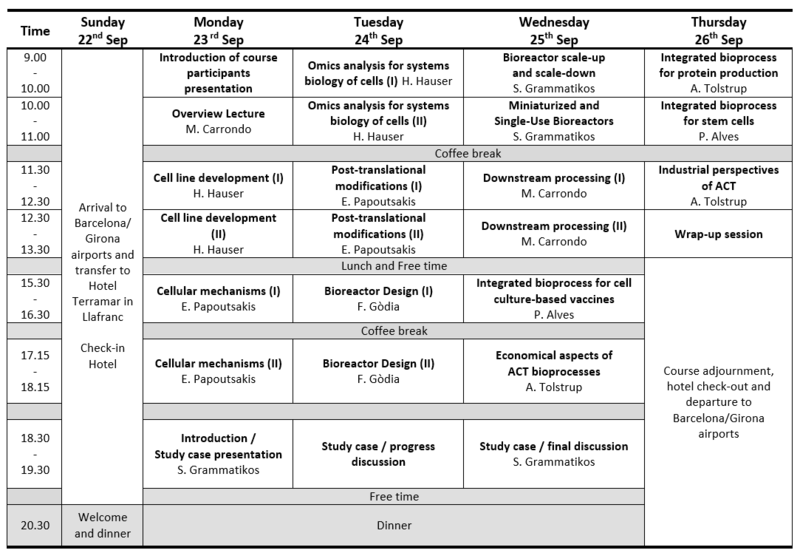 After the interest received by the previous seven editions and the excellent feed-back from the attendants, the 9th edition of the ACT course will be organized by the ESACT (European Society of Animal Cell Technology) in Llafranc, Costa Brava/Spain. ESACT is presenting this activity as one more contribution to the community involved in the use of animal cells in Biotechnology and Biomedicine. The program has slots dedicated to the preparation and presentation of case studies by participants, and discussion groups with the lecturers. Inquired speakers: Terry Papoutsakis (University Delaware, USA), Manuel Carrondo and Paula Alves (iBET, Portugal), Hansjörg Hauser (HZI, Germany), Francesc Gòdia (UAB, Spain), Nicole Borth (Boku, Austria), Stefanos Grammatikos (UCB Pharma SA, Belgium) and Anne Tolstrup (Biogen, Denmark). detailled and updated programme for 2019 !